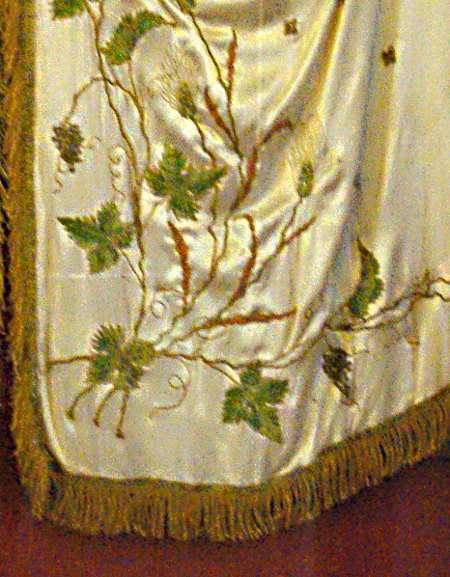 La Palma has a long tradition of gorgeous embroidery. 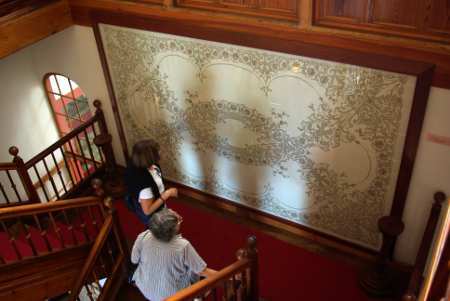 As I mentioned in my previous post, the embroidery museum is upstairs in the Red House, in Mazo. This gorgeous tablecloth in broderie anglaise is halfway up the stairs. 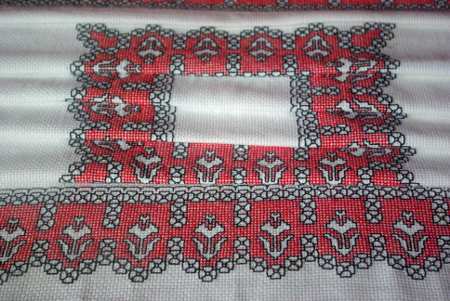 Assisi embroidery, a form of cross stitch. About the only thing in the museum I could see myself making. Now I’m fairly good at cross stitch, but the stuff in here is waaaaaaaaaaay out of my league. For one thing, it’s not done on aida cloth, which makes it obvious where the stitches go. This is all on fine cotton or silk, or occasionally linen. 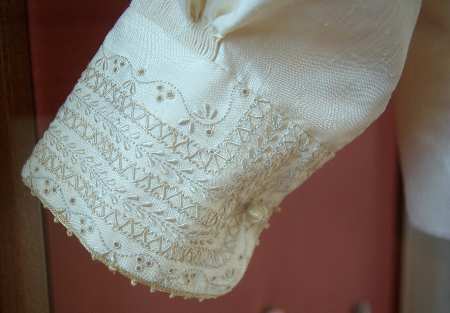 The commonest kinds of embroidery here are satin stich (bordado indefinido) , and a variation of broderie anglaise called rechi or richelieu. In the days before modern embroidery kits, pattens were copied onto tissue paper, and the lines marked out with lots of tiny pinholes. 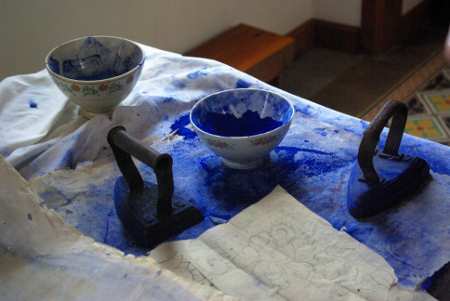 Then the tissue paper was laid onto the cloth, and blue dye ironed over it, so that the dye went through the pinhole and onto the fabric. A lot of the embroidery is so fine, I think you’d need young eyes and daylight to do it. So you’d spend years learning to work to that amazing standard, and then you’d have to give up by the age of forty. You know, I have mixed feeling about it. These are real works of art, and I’m always glad to see beauty created. But the vast majority of it was only created because some people could afford to buy a year of someone else’s time. 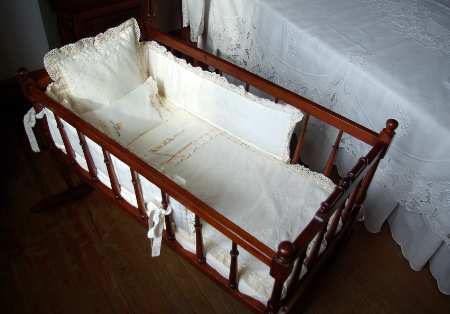 For example, these embroidered sheets and pillow case for a cradle are absolutely beautiful, but it’s really not practical. I don’t want to get too graphic here, but 19th century nappies can’t have been leak-proof, and babies’ cute little faces aren’t leak-proof either. Much as I coo over tiny people, I wouldn’t put one down on embroidered silk. 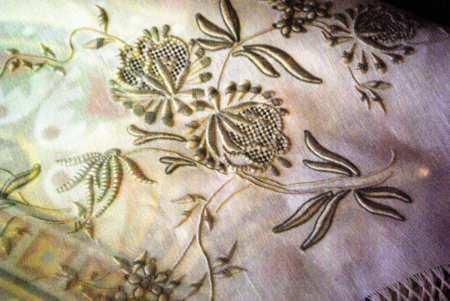 A cradle full of embroidered silk. 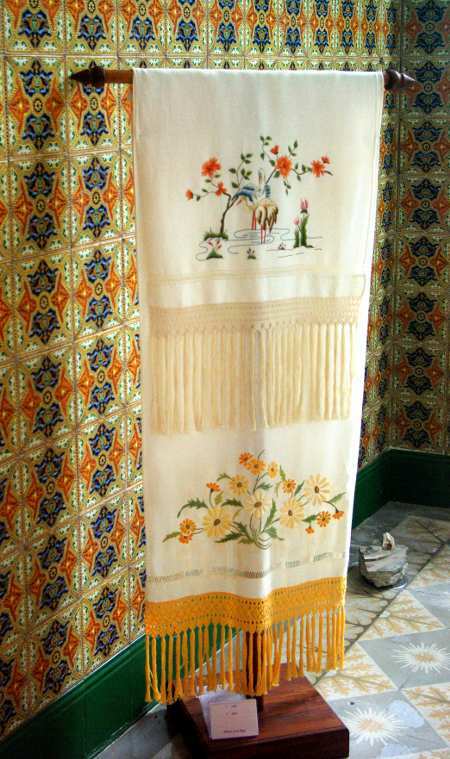 And this towel is far too lovely to dry your behind on, unless you were fairly contemptuous of the person who made it. 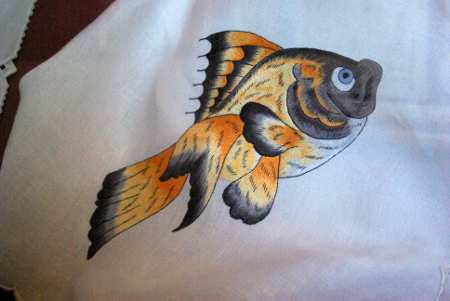 Satin stitch towel. Imagine drying your bum on that!